It seems that not even the trusty curtain is safe from the future. Apart from automating the opening and closing of the curtains themselves you wouldn’t think there was much to be done in terms of truly modernising window coverings. Well, it appears there’s definitely room for curtain evolution. Here are a few curtain developments that even a geek would be intrigued by. According to Japanese company Micro Reactor Co Ltd, the future of curtains is…… plastic. That is, a plastic which changes from clear to opaque at the touch of a button. In between the 2 flexible plastic panels which form the covering sit liquid crystal molecules which switch as an electrical current passes through. The result is an intriguing and surreal window that can change appearance in seconds. Designer Florian Kräutli decided to invent a new breed of window covering simply by adding dozens of small magnets to the material, the result being an incredibly versatile and moldable curtain that seems to stick to whatever shape you desire. This immediately negates the need for cords to both open/close the curtains and gives an impressively modern look to any room. A simple but brilliant re-invention. To find an example geekier than this incredible ASCII curtain by designer Nieke Sybrandy would require some serious effort. 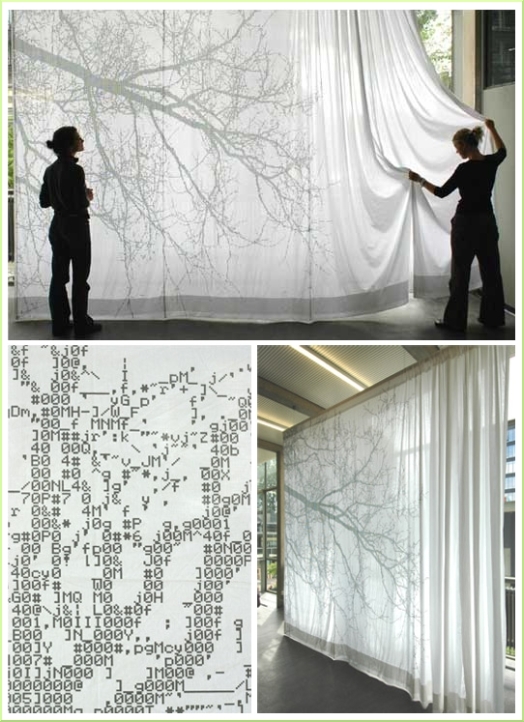 Printed on the fabric itself is the silhouette of a tree branch, in itself nice but certainly not geeky, however if you look closely you will notice that the branch has been created using ASCII characters. A worthy addition to any technology lover’s room. If you’re the kind of person who spends the majority of their time in front of the Wii, locked away from the outside world, the chances are you also can’t find the time or effort to rise from a seated position in order to open curtains. Help is on its way in the form of Wiimote controlled curtains as seen in the clip above. The Energy Curtain, developed by Swedish research projectSTATIC! 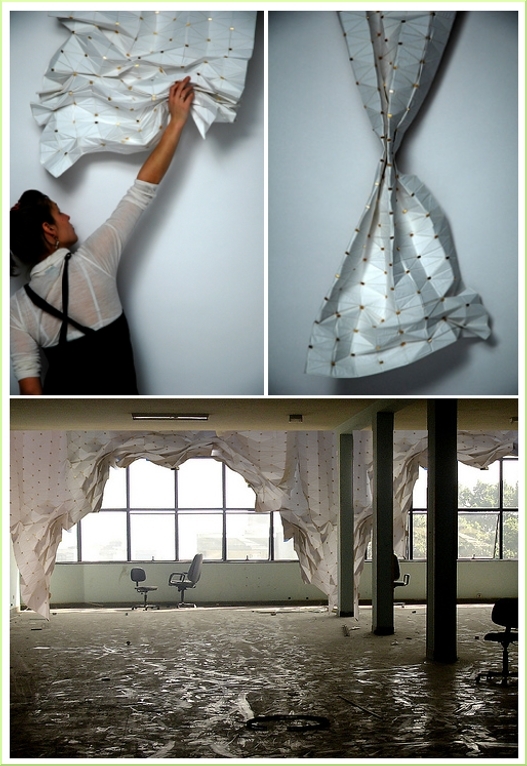 in 2005, is a window covering created using ‘a combination of textile, solar-collecting and light-emitting materials’. The amazingly effective result is a curtain that stores solar energy during the day only for it be used at night in the form of a gentle, power saving light source on the surface of the fabric. Why these aren’t already being used on a wide scale is baffling. Finally: Shower Curtains. I’ve been in the shower countless times and wished for some educational reading material, only to be deterred by the thought of soggy textbooks. If only I’d known about these shower curtains from TILCO. Printed on the material is enough information to keep you amused for at least an extra 10 minutes. 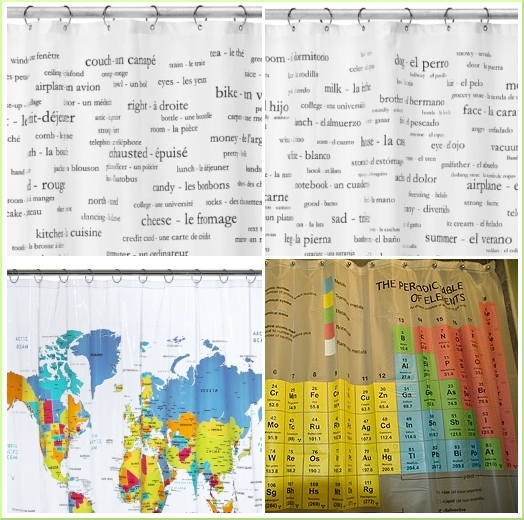 Curtains currently available include French Vocabulary, Spanish Vocabulary, Geography, Maths and The Periodic Table. Scrub ‘n’ Learn indeed.